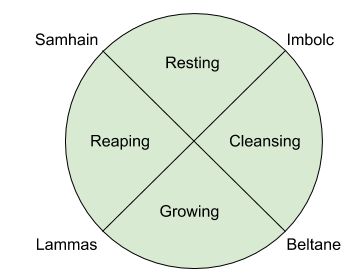 Some versions of the Wheel of the Year (the eight festivals of Wicca and Druidry) can feel excluding, particularly those that focus on the God and the Goddess interacting through the cycle of the seasons. This mythological construct excludes both polytheists and LGBTQIA people. Some versions of the story are uncomfortable for feminists, as they don't exactly promote consent culture. There are several overlapping cycles reflected in the Wheel of the Year. There's the vegetation cycle (from seed, through seedling, leaf, blossom, fruit, to seed). There are changes associated with cattle and sheep (when they move from the high pastures in summer, down to the low pastures in winter; when they produce lambs and calves). There's the turning of the seasons (Spring, Summer, Autumn, Winter) and the four tides of the year. There are the solstices and equinoxes, reflecting the changes wrought by axial tilt and the Earth orbiting around the Sun. Each of these overlapping cycles contributes to the symbolism of the festivals. If you have an apple tree in your garden or live near an orchard, it's great to celebrate the festival of wassailing. This involves singing and making noise to wake up the apple trees and encourage them to bear fruit. Some people leave offerings of toast in the branches and cider at the roots of the tree, and sing wassailing songs. My favourite is The Gower Wassail. Wassailing usually takes place on or around 17 January, or Plough Monday. In England, Brigantia (who may be the same goddess as Brighid) is the goddess of sovereignty and the land, so this could be a good time to celebrate regaining one's personal sovereignty or autonomy. The Spring Equinox is frequently associated with hares, rabbits, and eggs, but there's some intriguing older symbolism involving foxes. Beltane is the start of the growing tide and the festival of lovers, and all acts of love and pleasure are rituals of the Great Goddess. So, whether you're celebrating by leaping over bonfires or dancing round maypoles, the symbolism doesn't have to be heterocentric. Couples and groups of lovers of any gender can jump over the bonfire or dance around the maypole. Some pastoralists would drive their cattle between two bonfires, so you could make the bonfire-leaping more accessible by having two bonfires, so that those who cannot leap over the bonfire can run between the two fires. The first of May was also the Roman festival of Flora, the goddess of flowers. At summer solstice, the Sun rises at the same point on the horizon for about three days, and in the Northern Hemisphere, that point is the northernmost point at which it rises (it's the other way around in the Southern Hemisphere). The name solstice means "Sun stands still", and refers to the Sun rising at the same point on the horizon. This is the festival of harvesting the corn, wheat, and barley, and is the start of reaping tide. The Anglo-Saxon name Lammas comes from hlafmass ('loaf-mass'). Lughnasadh is associated with the god Lugh and his foster-mother Tailtiu, who ploughed the whole of Ireland and then died; Lugh established a festival of games in her honour. I tend to devise rituals based on this mythology and celebrating the harvest. At Autumn Equinox, day and night are equal in length, but the nights are getting longer. Autumn Equinox is the fruit harvest, so I associate it with the story of Pomona and Vertumnus, goddess of apple orchards and god of the turning seasons. Pomona was courted by several woodland gods, but wasn't interested in any of them. Then Vertumnus disguised himself as an old woman and came courting her, telling her of what a handsome chap Vertumnus was; then she was interested. There are some interestingly queer overtones to this story. At Yule, the Sun rises at the same point on the horizon for about three days, and in the Northern Hemisphere, that point is the southernmost point at which it rises (it's the other way around in the Southern Hemisphere). The name solstice means "Sun stands still", and refers to the Sun rising at the same point on the horizon. The name Yule possibly means "turning point", in which case it refers to the Sun appearing to move northwards after the solstice. Hence the line in Rudyard Kipling's A Tree Song, "the sun has come up from the south". One possible ritual is to carry a candle or lamp representing the Sun around the perimeter of the circle, from the South to the East, to represent the apparent journey of the Sun around the horizon. Because the Sun appears to be reborn at the winter solstice, this festival is often associated with birth and rebirth. But there are many cultures around the world that have a Sun goddess instead of a Sun god, and we can talk about the rebirth of the light instead of a literal birth. One ritual that I like to do is have everyone "give birth" to everyone else, by having each member of the coven crawl between the legs of all the other coveners, regardless of gender.